As a kid growing up in Tibet under China, the first song that I learned was The East Is Red. 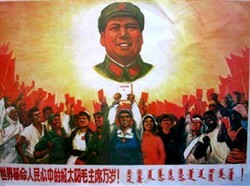 It was one of the most popular ‘red songs’ praising Mao Zedong and the Chinese Communist Party (the CCP). This was adapted — like most Communist propaganda songs — from a traditional farming folk song from China’s Shaanxi province. My father, who could read Tibetan, taught the words to my mother so that she could recite them when the commune leader made random checks to test if the villagers had memorised the lyrics. ‘The east is red, the sun is rising. China has brought forth a Mao Zedong. He has brought happiness to the people. An old woman in the nearby village had once casually sung a traditional song with the lyrics: ‘O White hill in the west, Move aside so that the sun won’t set too soon.’ She was accused of singing a ‘reactionary song’ in praise of Western imperialism and was treated to a thamzing or ‘struggle’ session, during which the accused were publicly humiliated and often beaten. When the People’s Liberation Army first marched into Tibet in 1949-1950, the newly- victorious CCP had already perfected propaganda songs as a means to educate the masses on the virtues of its version of socialism, and to legitimize its occupation of Tibet. Music could overcome the language barrier and had the power to instantly convey a political message. Taking a cue from Lenin, who said that literature and art are “a screw in the whole machine’’, the Chinese Communists have employed music as a core component of state propaganda to great effect. One of the first ‘red songs’ specifically composed for Tibet to celebrate its ‘liberation’from feudal serfdom and ‘imperialists’ was The Laundry Song. Like all other propaganda songs, The Laundry Song was performed at mass gatherings throughout Tibet and blared incessantly through loudspeakers installed in strategic public places. A 1964 music video of this song was widely shown and distributed. These massive public song-and-dance campaigns were held to disseminate political ideology through lyrics and to convince the people of the supposed benefits the CCP had brought. 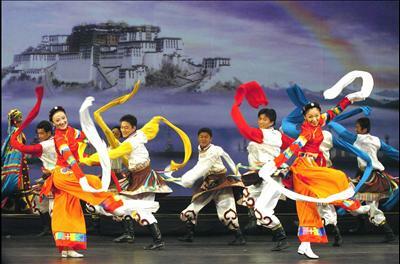 Dance troupes — mostly composed of young Tibetans taken to China and trained to sing in Chinese operatic style — were formed in all Tibetan districts, and these troupes traveled to the remotest Tibetan villages and nomadic camps to stage highly-sinicized versions of traditional music. 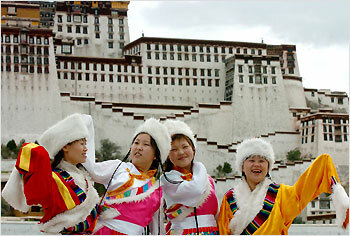 They were (and still are) dressed in hybrid costumes masquerading as traditional Tibetan dress. After my nearly three decades in exile, I still remember the lyrics of this song at public performances — the only entertainment we had during those times of terrible hardship. This was the most insidious assault on Tibetan identity. It imprinted unconsciously on Tibetan minds the idea of a New and Better China under the benevolent leadership of the CCP through repetitive, simplistic songs. During Mao’s Cultural Revolution (1966-‘76), every aspect of Tibetan culture came to a standstill. The traditional performing arts were completely banned. Even dance troupes were ordered to sing only Communist songs approved by Beijing. It was during this time that I remember my mother loudly memorizing the lyrics of The East Is Red. Like my mother, generations of Tibetans have grown up singing these songs without ever knowing what the lyrics meant. But through continuous singing and attending daily political meetings after each day’s work, they were made to find meaning in these words. While their own traditional songs and music were being wiped out, Tibetans have unconsciously been programmed to find meaning in this barrage of propaganda songs they learned to sing in Chinese. It is this inculcated habit of finding meaning in meaninglessness that now poses the gravest danger to Tibetan identity. The impact is particularly insidious for the new generation of Tibetans who have not experienced the terror of China’s invasion and occupation of Tibet in the 1950s nor the daily horrors of the Cultural Revolution. Still they are continuously bombarded with the Party’s version of history. They see Mao as a benevolent leader who united China and ‘liberated’ Tibet from the ‘feudal lords’. I have had some painful and heated debates with friends who have recently escaped from Tibet. They blame the Tibetan aristocrats and the monastic community for presiding over a social order so corrupt and oppressive that it somehow warranted a military ‘Liberation’ by a foreign power. In today’s globalized and networked world, the CCP still daily dictates to Tibetans which songs they are allowed to listen to and which songs they may not sing. While blatantly promoting ‘patriotic’ singers — such as Tseten Dolma, the veteran Communist nightingale, and Sonam Wangmo, a hip and stylish new-generation Tibetan mascot for the PLA — the CCP leaves no stone unturned in curtailing, persecuting and imprisoning those who fail to reinforce its message. In January 2010, the authorities sentenced the singer Tashi Dhondup to 15 months’ ‘reform through labour’ for his music album, Torture Without Trace. Dhondup was released in February 2011. Earlier, in March 2008, another young Tibetan singer, Dolma Kyi from Golog in Eastern Tibet, was arrested for composing and singing ‘reactionary songs’. Dozens of performers have been arrested since 2008 on such charges. In May 2010, 27 popular Tibetan-language songs were listed as banned in Tibet — whether in audio or videodisk format, or as digital media files on cell phones. “Anyone possessing illegal music or videos will be severely dealt with,” the authorities warned. Like the list of words blocked on the internet in China, the list of songs banned in Tibet gets longer each year. As of this year, it includes Shabalep, banned by China’s State Council Information Office on 2 April, and The Sound of Unity. Tibetans are prohibited from playing these songs or storing them in any electronic device. Shabalep, a You-Tube rap sensation in praise of a popular snack, (Shabalep also means ‘spank on the bottom’) seems as harmless an expression of Tibetan identity as one could wish for, while The Sounds of Unity by Sherten, a well-known musician from Amdo in Eastern Tibet, calls on all Tibetans to unite. “If you care about the future of our people/All three provinces should unite…” Sherten sings. The battlegrounds for the CCP to try to control Tibetan people’s thoughts — and to make them believe in the legitimacy in its control over Tibet — have shifted down to this micro-management level of representation and symbolism. Beijing brands assertion of any unique identity that goes against Marxist-Leninist-Mao Zedong thoughts as ‘reactionary’ and ‘counter revolutionary’. To this effect Beijing has cracked down on Tibetan Buddhism, Falun Gong and spends enormous amount of its energy and resources to re-write the entire Tibetan and the Chinese history to fit in the Communist ‘ideals’. Moreover, in its quest to become a global leader on par with the US and Russia, the CCP does not tolerate any challenge to its official narrative and image. The Chinese leadership’s reactions to songs such as Shabalep — and the extend to which they are ready to go to stamp out any Tibetan voice and collective representation, however muffled — indicates Beijing’s paranoia and ridiculous nervousness that is unbecoming of an aspiring superpower. This approach also makes itself surprisingly vulnerable to subversion and ridicule at this level. As the CCP celebrated its 90th birthday on 1 July, the entire apparatus of the propaganda department is in action to repackage and bring those ‘red songs’ from the early 1950s and from the era of the Cultural Revolution back to life. These songs are re-mastered and mostly re-sung by a new generation of state-approved Chinese and Tibetan singers. The re-launching of these ‘red songs’ on a massive scale and making Tibetans at all levels of society memorize the lyrics by playing them ad nauseum, is still Beijing’s preferred and perfected propaganda method in the digital age. Like my mother, who memorized the words of The East Is Red without understanding what the words meant, a new generation of Tibetans are being pushed to do the same. In effect, this is another Cultural Revolution. My niece and nephews, who live in the same village where I was born over three decades ago, still sing The Laundry Song at school. Who is going to help us harvest barley? Who is going to help us build new houses? Without the freedom to know their culture and access their rich yet fast-disappearing traditional music, children in Tibet today are left lurching in a ‘New Tibet’ dominated by ‘the New Majority’. The struggle for freedom is a struggle for representation, identity and the culture that coalesces a people together. In this sense music is a prime factor uniting people to resist against occupation. There is real danger that a generation or two from now, youth in Tibet may no longer hear songs about Tibet’s mountains, rivers and astounding landscape in their own language. That is why Tibetans, both in and outside Tibet, need to now compose, sing, share and distribute as widely as possible the songs of freedom and resistance, songs about the snow-capped mountains, blue rivers and the high plateau. We need to sing more songs that not only enrage the CCP but also put its entire propaganda machinery on alert to block word after word and phrase after phrase and its entire security apparatus up in arms trying to ban song after song after song. When that day comes, Tibetans will be speaking in a language that Beijing can and will not understand and sing songs that the CCP will never comprehend. Beautifully written, clearly illustrates the power of music to unite a culture or destroy one. Thank you. wonderful article! i’ve just put 10 tibetan songs on my ipod.